The leader of Basildon Council has welcomed 20 new apartments available for the borough’s keyworkers and residents. Sempra Homes, the council’s house building company, began work to construct the new homes last summer. 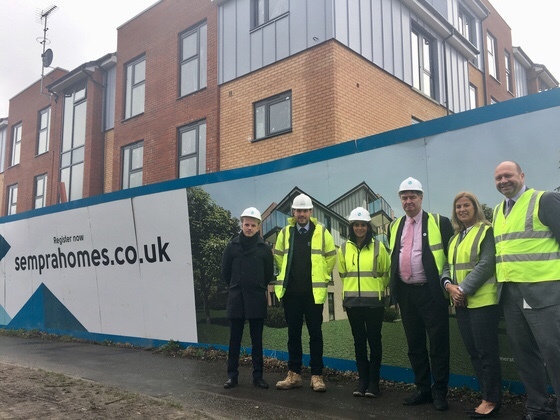 Leader of Basildon Council, Cllr Andrew Baggott, attended the site in Long Lynderswood, Lee Chapel North, yesterday (Tuesday 19 March) to see progress on the build. The new homes at the Space site, which will be known as Maplewood Court, include a development of 20 two-bedroom shared ownership apartments along with car and cycle parking and associated landscaping. They will be marketed specifically to local key workers like teachers, nurses and police officers on a shared ownership basis. Cllr Andrew Baggott, Leader of Basildon Council, said: “It’s fantastic to see these beautiful apartments spring up from what was once a wasted patch of land. Sempra was set up with the aim of building high-quality and affordable homes for our residents.